Attach shopping receipt as proof of purchase. Submit completed entry form via mail to: "Jalan-Jalan Cari Kawan Contest", Kawan Food Manufacturing Sdn Bhd, Lot 20, Jalan Pengapit 15/19, 40200 Shah Alam, Selangor. 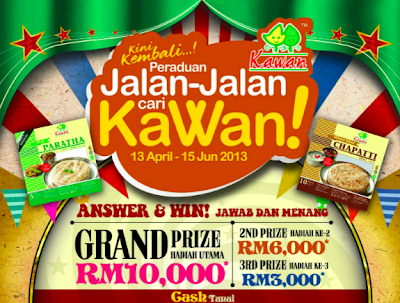 Visit Kawan Food Facebook for more details.